Thanks to a photography project that took place in a rainforest in Gabon, Africa, we now know that humans aren't the only ones who can get wrapped up in their appearance.French photographer Xavier Hubert-Brierre set up a mirror in the forest and captured footage of a male leopard visiting it repeatedly. 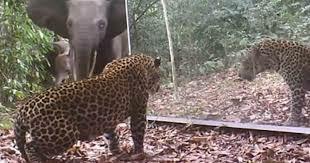 In the video below, you can see the big cat rubbing his face and body on the mirror. It's as if he can't get enough of just how good he looks!Unfortunately for our spotted friend, some unexpected visitors show up to chase him off. Poor guy!